At 8.30 the next morning I left Invercargill and travelled west towards Riverton. I was hanging out for a decent coffee and luckily discovered that Riverton is the perfect place for a caffeine fix. 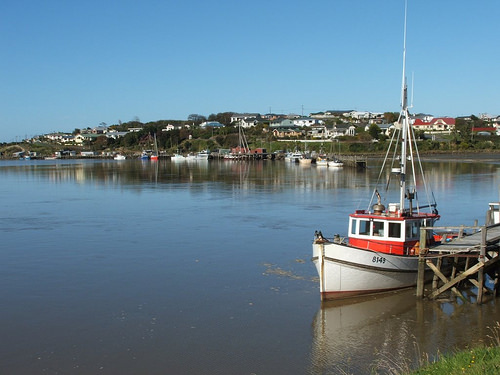 With 30 mins to spare before my next meeting, I took a drive around the Riverton shore line, the “Riviera of the South” and what a beautiful sight it was! Even though it was clouded with mist, the sandy, rocky coast was stunning. The housing is classic “Kiwiana” with local “diaries” and even a great restaurant nearby (“Beaches Cafe”). My meeting with Joan at Hopcroft Homestay, went like clock-work. I have known Joan and her late husband for 20 years. They were originally farming people from the local region. After retirement they had this gorgeous lifestyle property / farm type B&B lodge. Imagine entering a cul-de-sac, driving to the end to a massive green paddock with a beautiful curvy driveway up the hill to the house about 500 metres away. What a stunning entry! And after so many years, Joan still has a welcoming pot of tea and home-made cookies ready for me. The people and the landscape down here Southland epitomise true “Kiwiland” spirit and you’ll be moved by it. Typical of New Zealand, the weather is dressed in her finest today with blue sky and plenty of sunshine (the farmers will love this). I am heading for “Nokomai Station”, located between Lumsden and Athol on the main route to Queenstown. Nokomai is one of the largest farms (or stations as the big ones are called) in New Zealand. A massive 36,000 hectare, it’s classic sheep country with lots of hills, mountains and glorious rivers running through the valley. With my trusty rental car I turn off the main highway and travel 14 km on unsealed road to the main farm building. During the drive I had my first encounter with another “classic” rural scene; a young shepherd with 5 dogs and about five hundred sheep blocking the road. A photo somehow doesn’t capture this scene, so I just sat back and absorbed a moment I’ll never forget, ever! 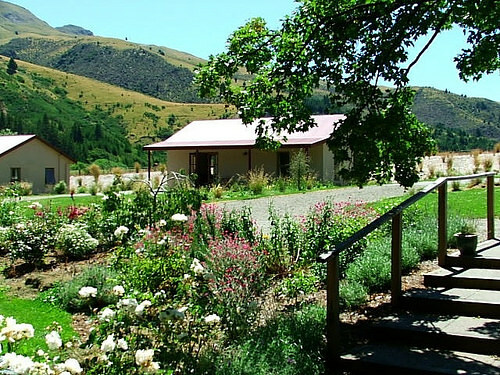 The cottages accommodation at Nokomai are situated away from the main farm house, but the property does have it’s own restaurant/ bar building where breakfast and dinner is served. 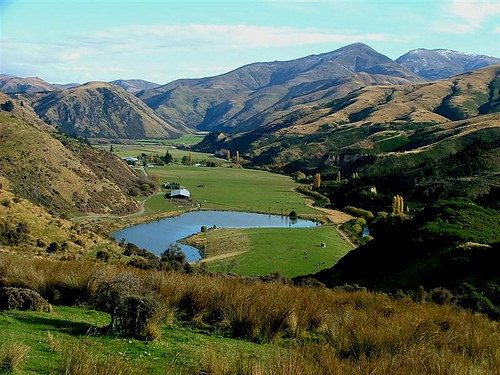 Ann, the farm owner, explained that travellers and many fishing people find their way to Nokomai wanting to experience the “real New Zealand”. Well folks, it doesn’t get much better than this! 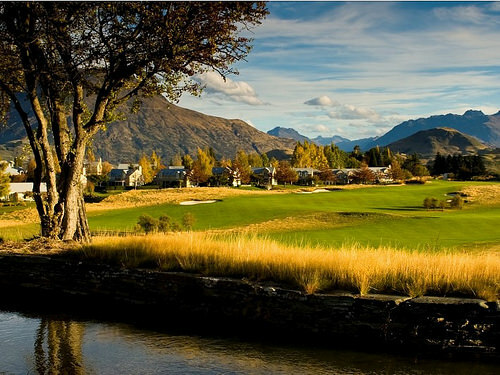 Reluctantly I have to continue my journey to Queenstown, to a totally different world – Millbrook Resort. At the reception I met with Adith the reservations manager, who very kindly committed an hour of his time to show me around the grounds…200 hectares of it! We climbed into a golf cart and zoomed around to have a look at the different room and cottage styles – Villa Suites (perfect for couples), or the 2 and 3-Bedroom cottage, perfect for families. With four restaurants on site, this stylish resort is perfect for weary travellers wanting to “chill out”. With superb health, spa and fitness facilities plus a 25 metre lap pool, Millbrook deserves it’s status as a world-class 5-star luxury golf resort. Adith tells that the guests who come to play golf, are in the minority and I can understand this.This privately owned resort is quite unique in New Zealand. Note to self: wedding anniversary coming up… make booking”. Riverton is definitely one of those little hidden gems. Our holiday playground when growing up as kids so many good memories. As for Nokomai – a little piece of heaven. I can envisage for myself sitting there enjoying the “traffic jam”. It’s such a pity that travellers still miss out on seeing the Southland area. But interest is slowly trickling through. Jan, your childhood memories of Riverton are so precious as the area is largely unchanged in character. Riverton is a cracking little spot and the whole of Southland deserves a proper tour all of its own doesn’t it? A couple of days galloping through Queenstown and Arrowtown only gives a hint of what this wild and atmospheric area of NZ has to offer – and a great Kiwi welcome as well. Yes Jane, the whole Kiwiana vibe in Riverton is so endearing. The eastern part of Southland known as The Caitlins is also fantastic example of the “wild and atmospheric” description you refer to.